By Nathan Letts, M.A., M.Phil. An incident came to our attention through a national computer network involving Dutch Mordant waste at a university. The physical plant was asked to fix some damaged pipes and wanted the Environmental Health and Safety staff to check for chemical hazards before they started work. Environmental Health and Safety suggested that the art department collect the waste etching solution in poly jerricans and give it to the hazardous waste staff instead of dumping it down the drain. They used the jerricans for about a year without incident. A professor in charge noticed that a jerrican was bulging out. He carefully opened the container to release the pressure, and not surprisingly, a gas that was a respiratory irritant came out. The etching had been done in the basement of one of the student dormitories! Large quantities of concentrated acid under pressure are very dangerous because they might rupture the container. Dutch mordant is typically 10% hydrochloric acid in water with potassium chlorate added. The potassium chlorate would readily react anything in the waste solution, grease, dirt, etc. The gas in the closed jerrican was either chlorine or chlorine dioxide. Potassium chlorate is a key ingredient in many explosives. In the Chemistry of Pyrotechnics: Basic Principles and Theory, potassium chlorate is listed as one of the most hazardous oxidizing agents used in explosives. It is so reactive that it reacts explosively with organic compounds, sulfur compounds, and sulfuric acid. It can react violently with dirt or clothing. The safest material for etching copper plates is ferric chloride (iron perchloride). This forms acidic solutions that should be handled accordingly, but does not have the dangers of handling concentrated acids. ANSI-approved safety goggles are a must. Acid safe gloves (neoprene, Buna-N or nitrile) are needed. When working with acids, an eye wash station must be nearby. If ferric chloride is not adequate for your etching, it probably means using nitric acid or Dutch Mordant. These are strong acids and require a safety shower as well as protective clothing. Nitric acid has additional hazards, as it is an extremely strong oxidizing agent. It will react violently with organic compounds (solvents, acetic acid etc. ), and should therefore be stored in an acid-safe cabinet away from oxidizable materials. Nitric acid gives off various nitrogen oxide gases, including nitrogen dioxide, a strong lung irritant that can cause emphysema. Local exhaust ventilation, such as a slot hood or a fume hood, is absolutely necessary for these etching baths to remove the noxious gases. 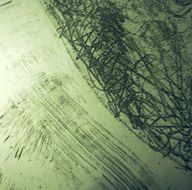 The basement of a school dormitory is an inappropriate place for etching and printmaking. We also believe that students should be taught how to neutralize their own etching baths with bicarbonate. While using adequate local ventilation and eye protection, the sodium bicarbonate (baking soda) is slowly added to the acid in an oversized container. The neutralization is complete if it does not fizz as more bicarbonate is added. While large universities may have waste disposal services, teaching the students to neutralize their own solutions prepares them for independent studio work. This article was originally printed for Art Hazard News, © copyright Center for Safety in the Arts 1990. It appears on nontoxicprint courtesy of the Health in the Arts Program, University of Illinois at Chicago, who have curated a collection of these articles from their archive which are still relevant to artists today.